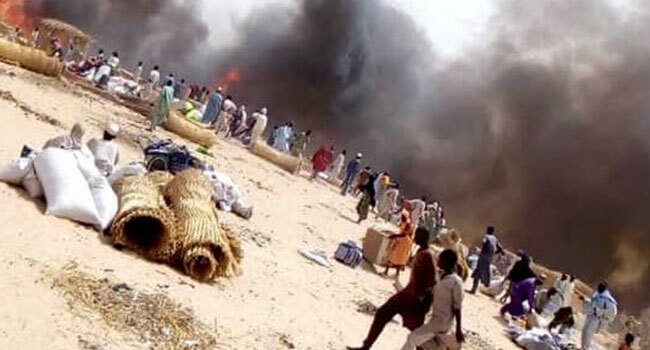 Several people are feared killed in a fire that broke out in an Internally Displaced Persons (IDP) camp in Gajiram, Nganzai Local Government Area of Borno State. The incident, which occurred on Thursday, claimed the lives of four people – two children and two elderly persons — according to the media officer of the Borno State Emergency Management Agency (SEMA), Mr Ibrahim Uba. He disclosed that no fewer than 4,000 households were affected by the fire while the only hospital in the community was also razed down. Uba added that a high-level delegation constituted by SEMA had visited Gajiram to assess the extent of damage and get first-hand information from those affected. Meanwhile, a humanitarian organisation, Norwegian Refugee Council, said it gathered that eight people died and two others critically injured at the affected hospital. In a series of tweets on Saturday, it noted that more than 10,000 homes were destroyed while about 15,000 people were displaced as a result of the inferno. According to the organisation, the fire started as a result of a spark from a cooking stove used by a child preparing her food. But an eye witness told Channels Television that the inferno was fuelled by a whirlwind, which made it spread fast, burning down shelters in the camp. It said the victims of the incident were dispersed and seeking shelter under trees and many of them exposed to direct sunlight. Three persons had died in a similar fire outbreak which occurred in February at an IDP camp in Monguno Local Government Area of the state. NIGERIA – A hospital was caught in the fire, resulting in the death of 8 patients, while 2 remain seriously injured, according to our latest info.